To be effective, the NIPN should in principle be an integral part of the existing multisectoral nutrition system at national level. This can be facilitated by creating the NIPN Multisectoral Advisory Committee (MAC) as the formal structure connecting NIPN to the national multisectoral and multistakeholder nutrition coordination system. As shown in the visual below, the MAC links the NIPN country team with national stakeholders and decision makers, and plays a critical role at the different stages of the NIPN operational cycle. Throughout the NIPN operational cycle, the MAC contributes to a clear and regular two-way information flow between the NIPN team and the national stakeholders and decision makers. It is a critical element of the NIPN structure, which stimulates and contributes to policy dialogue at national and - where appropriate - sub-national level. Ideally, the MAC is formalized through a government-approved mandate or decree to ensure leverage and to mobilise the decision-making power of higher level national multi-sectoral and multi-stakeholder coordination structures in nutrition (see the Guatemala case study in this section, page 9). In most countries, particularly those that have signed up to join the Scaling Up Nutrition (SUN) Movement, multisectoral coordination mechanisms for nutrition are in place and functional. These are typically structures with membership from all nutrition-relevant ministries such as health, agriculture, gender, water, and planning among others. In certain countries this structure falls under the highest political level such as the President’s or Vice President’s Office and in others the coordination falls under a particular ministry. In most countries these coordination structures are established at national level. In some countries they are also being established at sub-national level. If coordination at the sub-national level is in place, a MAC can also be established at the sub-national level (see the Guatemala case study in this section, page 9). Embedding a MAC in existing structures facilitates strategic influencing of policy decisions, fosters ownership, avoids duplication of efforts, and ensures institutionalization and sustainability of the MAC. 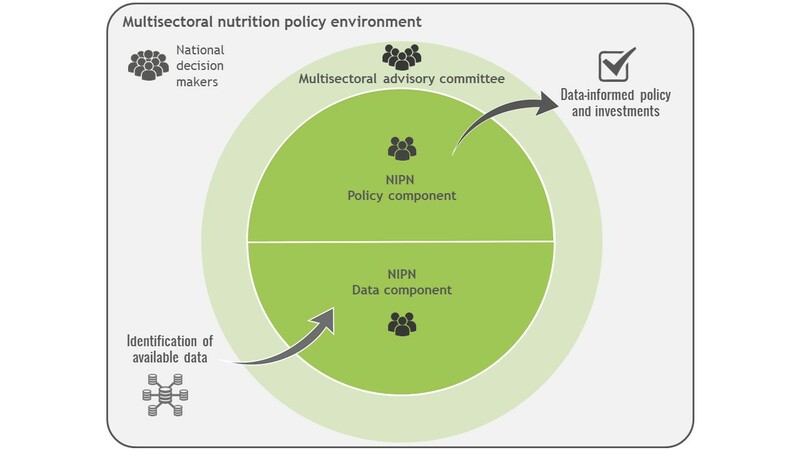 Each country has its unique multisectoral nutrition coordination structure and the NIPN MAC should be anchored in this existing structure. In countries where a national multisectoral nutrition coordination structure is not yet existent or functional, it is still important to establish a MAC, linking NIPN to the relevant line ministries which are responsible for nutrition-specific and nutrition-sensitive interventions. Scenario 1: Countries that have functioning national multisectoral coordination structures in place which meet the MAC’s purposes and role. Scenario 2: Countries that have functioning national multisectoral coordination structures in place which do NOT meet the MAC’s purposes and role. Scenario 3: Countries that do not yet have a national multisectoral coordination structure officially in place. Each country set-up will be linked to a different scenario, influencing how the MAC can be established and how to best anchor it to multisectoral coordination structures. 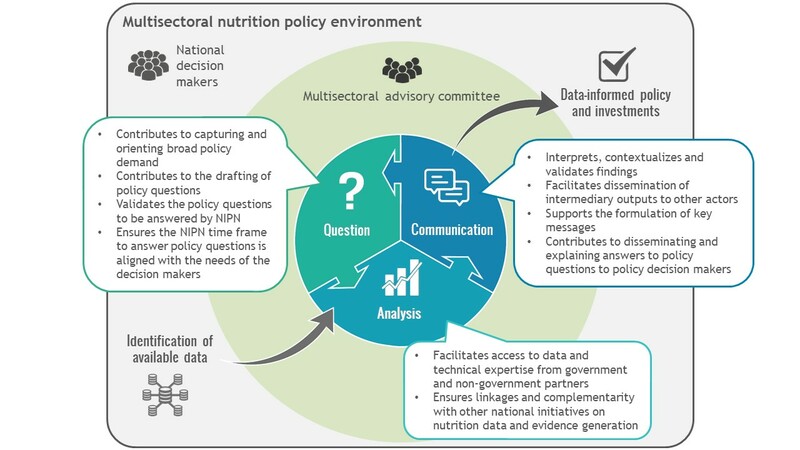 NIPN operates through a three-stage process of question formulation, data analysis, and communication of findings to influence policy decisions in nutrition. The MAC has a critical role to play in ensuring that the focus of these processes is relevant, appropriate and timely for the different stakeholders. Based on the review, several options will become apparent. It is important that all options are considered and discussed with the national government and non-government partners to reach agreement. The MAC will be most effective when there is full consensus among stakeholders on its positioning, composition and mandate. A multisectoral committee already exists and can efficiently take on the MAC role (scenario 1). A multisectoral committee already exists but does not have the capacities to efficiently take on the MAC role. In such cases, a new committee or sub-working group may be created that formally links to the existing structure. Linkages need to be spelt out (scenario 2). A multisectoral coordination structure does not yet exist in country, or is not fully functional. In such cases, a MAC will need to be formed with clear links to decision makers (scenario 3). Functionality: Is the proposed option currently functioning appropriately, with regular, well-attended meetings, visible outputs and noticeable linkages to high-level coordination structures which are being leveraged when needed? Efficiency: Does the proposed option operate in an efficient way? Does it have the ability to convene the right people and to produce high-quality outputs in a relatively short time frame? Representativeness: Does the proposed option allow for full representation of all sectors involved in the Multisectoral Nutrition Plan of Action, and is there active participation of all these representatives? Authority: Does the proposed option have the authority to convene and are the opinions and recommendations of the committee listened to and acted upon by high-level authorities? The Chair of the MAC and its members will need to have the capacities to take on their roles. These roles are not minor and therefore sufficient time needs to be allocated to the MAC meetings and follow-up work. High-level Chairs may not have sufficient time to prepare an agenda or follow-up actions of a meeting and therefore require a good Secretary with sufficient time allocation to do this work. It could be a member of the NIPN core team. Experience suggests that the Chair and the members need to be officially nominated by their respective government institutions, and mandated to participate, speak and act on behalf of their institution. Practically, this could be done by an official memo from the Human Resources department; this will ensure dedicated participation. Appointing alternates may reduce the risk of gaps due to high turnover in government bodies. In addition to the above, it is useful to select a Chair who has ‘soft’ skills in trust building, consensus building and conflict management. She or he should have the convening power and ability to mobilise engagement and action across sectors. Nominated MAC members and alternates from government institutions could benefit through the capacity building efforts of NIPN, such as participation in workshops and webinars related to the NIPN operational cycle of ‘questions-analysis-findings’. Examples illustrating this approach can be found at country level: Ethiopia involved all the members of the National Monitoring, Evaluation and Research Steering Committee in the inception workshop of the NIPN Capacity Strategy development while Guatemala embarked the core MAC group composed of four key ministries on the workshop initiating the NIPN question formulation process (see the case studies on Ethiopia and Guatemala in this section, page 9). The NIPN in Guatemala has been fully integrated into the national coordination structures for food security and nutrition. A working committee of the existing Inter-sectoral Technical Committee (CTI), which was created by law, will perform the function of Multi-sectoral Advisory Committee. This set-up not only ensures institutionalization of the MAC, but also its legitimacy and authority to create a data-driven policy dialogue and influence policy decisions. Download the MAC Guatemala case study in pdf format. Integrating the functions of a MAC into an existing coordination structure ensures its authority, strategic influence and sustainability. Download the MAC Ethiopia case study in pdf format.